…we can’t imagine anyone not enjoying the type of balanced and exciting sound the HD 600 system offers. 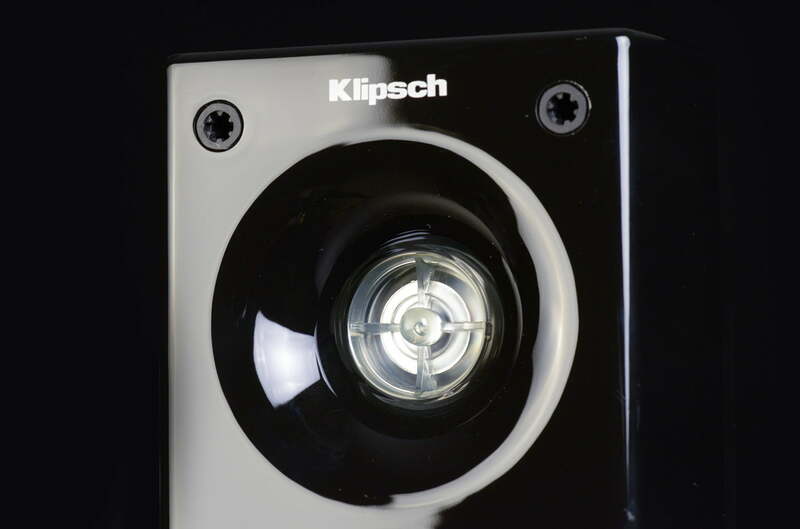 While most loudspeaker companies tend to release all new products every couple of years or so, Klipsch seems to prefer taking the evolutionary route. As an example, one need only look at the company’s physically-imposing, high-efficiency, Klipschorn loudspeaker, which has been in continuous production and refinement since its debut in 1946. And one can’t help but notice the strong resemblance between the mighty RF-62 II system we reviewed last year and Klipsch’s previous generations of RF series speakers. Same goes for Klipsch’s compact series of HD Theater speaker packages. We favorably reviewed the HD Theater 500 system several moons ago, deeming it to offer audiophile level performance at a real-world price. 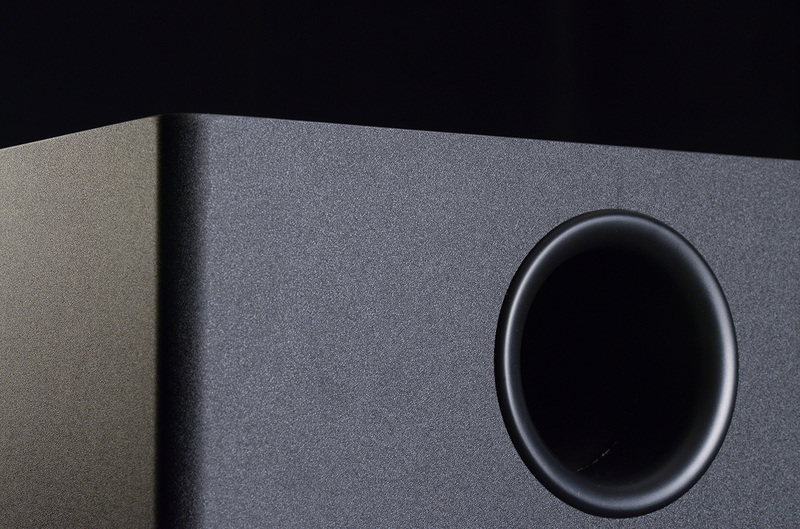 The HD Theater 600 is the latest iteration of that system. We put one through its paces to see how it performs in today’s increasingly-crowded budget speaker category. We had to do a double take when we first pulled the HD Theater’s speakers from their boxes. We honestly weren’t expecting such smooth and blemish-free, gloss black painted baffles would grace such a low-priced system. In fact, the satellites were finished to such a high standard, one could easily mistake the enclosure material as something other than plastic at first glance. We also were impressed with how inert the HD 600 satellites felt in the palm of our hand. Not super-heavy, mind you, but definitely heftier than a similarly-sized “home theater in a box” -type speaker. And with dimensions of only 6 x 3.6 x 3.85 (H x W x D – in inches), the front and rear satellites were certainly small enough to fit easily into our palms. Their diminutive size should definitely be a bonus when it comes to integrating them in a small room or for those with limited space. Even the center channel, with its twin woofer array, wasn’t significantly larger at 9 x 3.6 x 3.85 (H x W x D – in inches). Taking a peak underneath the satellites’ and center channel’s well-finished grilles, we noticed some high-quality graphite woofers and metal-dome tweeters that would appear to be a cut above what one would normally expect at the price. 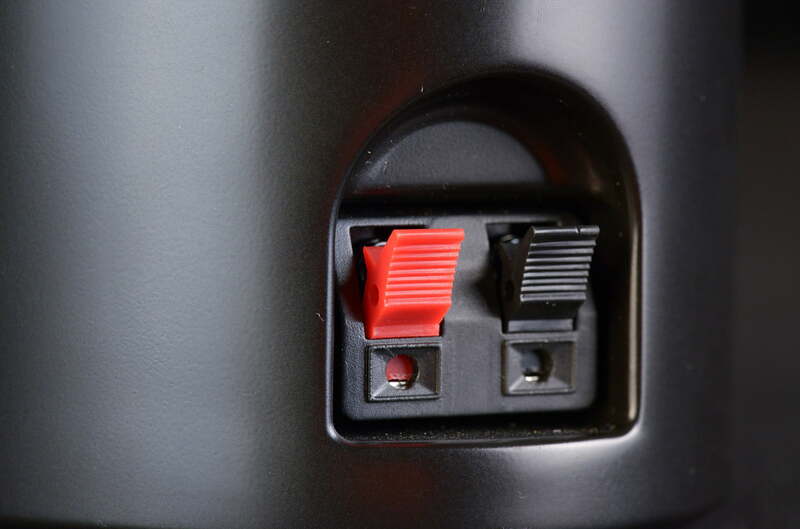 And since the enclosures are molded plastic, those drivers are mounted on the insides of the front baffle so that there isn’t an exposed screw or bolt in sight. This results in a smooth, streamlined appearance for all of the main speakers when their grilles are off, upping their show-off potential in a major way. Of course, cost concessions have to be made somewhere in a $600 speaker package, and for most manufacturers, that means skimping on the subwoofer’s finish just a bit. So it goes with the HD Theater 600 system. Well-made though it may be, the subwoofer’s MDF enclosure is given the ubiquitous “black vinyl wrap” cosmetic treatment. Still, it’s nothing to complain about at the price, especially considering most folks will likely tuck it into a corner somewhere and out of sight. As befits a Klipsch design, the HD Theater 600 satellites and center channel feature a flared and contoured baffle area that serves to horn-load the .75-inch aluminum dome tweeter. Klipsch calls this its “MicroTractrix” horn, which increases the tweeter’s output capabilities and, consequently, its efficiency. The tweeter also utilizes a clear plastic waveguide assembly that should help extend its dispersion out to the horn area. The satellite’s lower frequency duties are handled by a 2.5-inch, injection-molded graphite (IMG) woofer with rubber surrounds. The front and rear satellites feature a single woofer in each enclosure, while the center channel features two. The enclosures are made from a molded ABS plastic and are sealed designs. Curved sides and rounded back baffles help with structural rigidity and reduce internal standing waves. 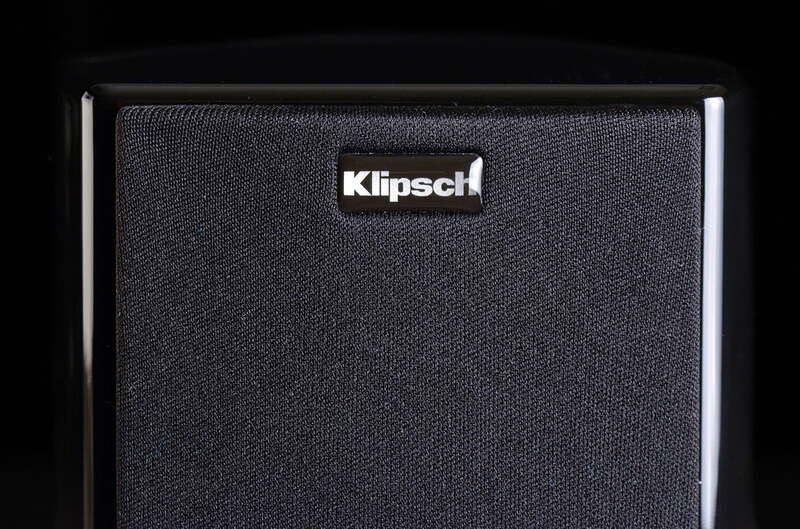 Each of the main speakers can be placed vertically or horizontally, and Klipsch includes a set of self-adhesive rubber pads to help protect your furniture and the enclosures. They can also be wall or stand-mounted in either orientation via a single threaded insert on the backs of the enclosures. A set of plastic wall mounting plates for all of the main channel speakers, and a cradle for placing the center channel on a tabletop, are also included. The mounting plates feature a locking mechanism that will accommodate up to a 40 degree, left-right swivel when mounted horizontally and a similar range of up-down tilt when mounted vertically. Unfortunately, the HD 600’s wire connections don’t keep pace with the satellites’ many other fine qualities. Klipsch decided to outfit its HD 600 speakers with some spring clip-type speaker wire terminals which, while far stouter than most HTIB spring clips, still limit wiring options. While most folks using a system like this will probably be fine using a small-gauge wire, the audiophile in us can’t help but feel these otherwise well-conceived speakers are besmirched a bit by being limited to wire 15 AWG wire or smaller – even 15 AWG is pushing it a bit. 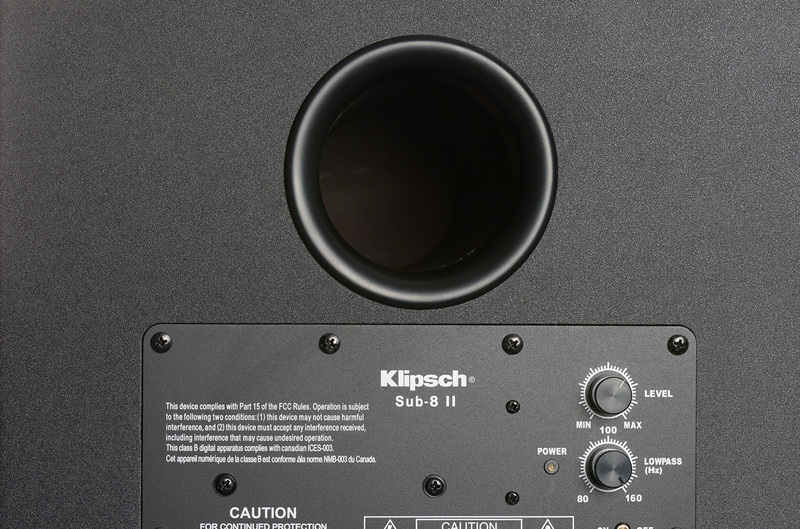 The included subwoofer has been redesigned from the HD 500 series and now has its large, 3” diameter port on the backside instead of the bottom, where the 8-inch, fiber-composite cone woofer resides. Its internal, digital hybrid amplifier is rated at 100-watts RMS, and the sub’s claimed low end response of 33 Hz should allow it to dig pretty deep in the bass for an 8-inch design. 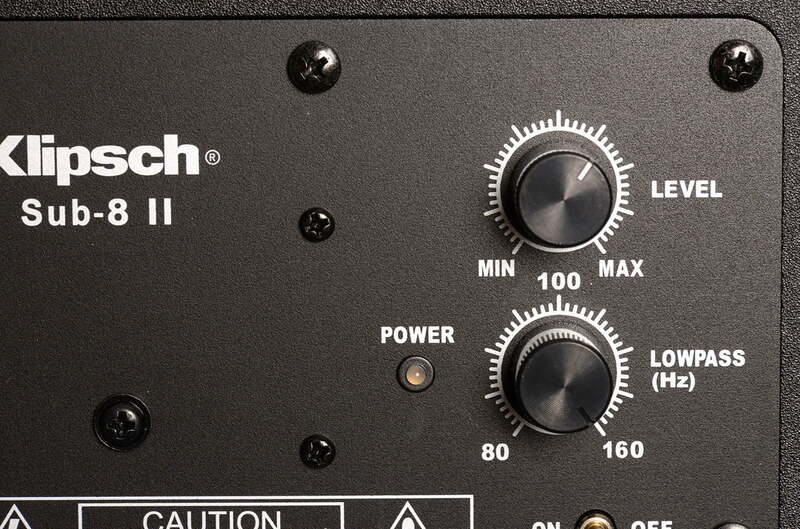 The sub also includes a basic set of adjustment controls, such as volume, crossover, phase, and auto on/off switch. 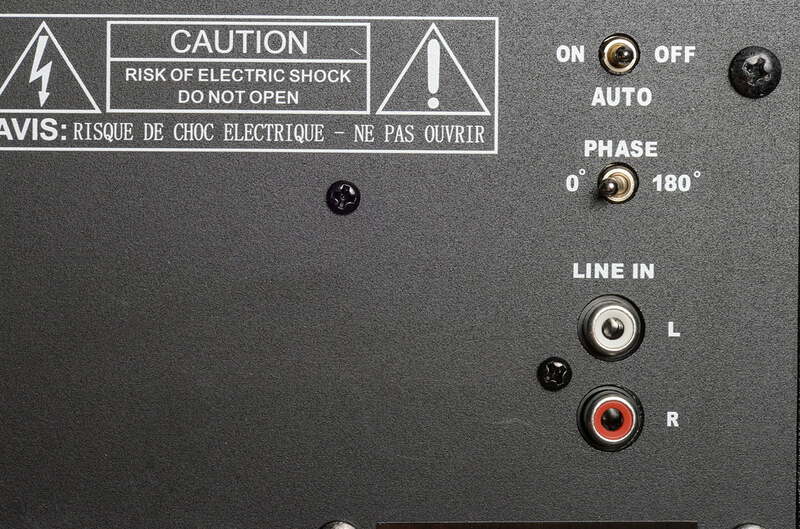 All users will have to run a cable from their receiver’s LFE output to one or both of the subwoofer’s left/right line level, RCA inputs; speaker level inputs are not included. Setting up the Klipsch system was mostly straightforward, but we did run into a bit of a snag at first. We’re not sure why, but the Klipsch HD Theater 600 ended up being more placement sensitive than the average sub/sat system. We first tried setting up the front channels in our theater room where miniature speakers usually work best—on a pair of 31” high stands, 8 feet apart, 1 foot away from the wall, and approximately 10 feet away from our main viewing position. Unfortunately, they sounded dreadful this way, with a severe lower treble dip and upper treble roll-off and some congestion in the upper bass. Once we started experimenting with placement though, we found that moving the speakers even one or two inches this way or that made a pretty big difference in the sound. Even slightly altering their toe-in angle made noticeable differences for better or worse. At that point, we knew we were in for a longer-than-usual set up routine. After quite a bit of experimentation, we settled on placing them directly on the edges of our A/V stand, which put them about 6 feet apart, a foot out from the wall, and a low-ish 2 ½ feet up from the floor. Bottom line: Our results consistently showed, somewhat unexpectedly, that the Klipsch HD 600 satellites yielded the smoothest frequency response when they’re positioned slightly to moderately below the listening axis, so be prepared for lots of position tweaking and a lower than normal placement—or at the very least, plenty of experimentation—when it comes to the front channels. Test equipment for the Klipsch HD Theater 600 system included a Yamaha RX-A3020 and Marantz NR1602 A/V receivers, a Samsung BD-C5500 Blu ray Player, HP Pavilion G6-2320DX laptop, Samsung UN40C6300 LED TV, and an Apple iPhone 4. After we got their positions dialed, we let the Klipsch system break in for about 20 hours or so before attempting any serious listening. Once we did however, our patience in setting up the package proved worth the wait: The Klipsch HD Theater 600 delivered a clear, well-balanced, and spacious sound, with excellent midrange clarity and articulation. Indeed, its tonal balance is nothing like the much more upfront and aggressive sound produced by some Klipsch designs of yesteryear, while still delivering the excitement factor the company’s speakers are famous for. About the only nits we had to pick with the Klipsch system were with the sonic regions either side of the midrange. It’s that excellent spectral balance that made marathon movie sessions a breeze. For example, we intended to watch only a couple of chapters from Kill Bill, Volume 1 and Joe Wright’s 2005 version of Pride and Prejudice, but we ended up watching both movies all the way through. What’s more, we did so without experiencing much in the way of listener fatigue. The HD 600’s sounded clean, clear, and detailed enough for us to simply forget about the system altogether and enjoy whatever movies we felt like watching. The Klipsch HD 600 could also shake things up a bit – literally – when called for. Spinning up our favorite action sequences from various Marvel and DC universe flicks, such as the last battle scene from The Avengers, the potent little sub sent good vibrations all throughout our theater room. It was only when we moved the system to our much larger living room that it lost a bit of steam and some dynamic impact. Still, this brawny 8-incher always sounded well-matched to the satellites and rarely left us wanting for more. In fact, the Klipsch system’s subwoofer and satellites were uncannily well-matched for such a low-priced system. Regardless of which room we placed the HD 600 system into, bass always sounded as if it was a natural, interwoven part of the sonic picture, and it never stuck out as a separate entity. The Klipsch HD Theater system proved just as capable with music as it was with movies. Music that’s heavy on rhythmic bass and treble accents, such as Justin Timberlake’s surprisingly outstanding recent release, The 20/20 Experience, had much of its low-end wallop and treble sparkle intact, coupled to a lively, exciting, and boogie-friendly overall presentation. We tried one bass-rich album after the next, such as Radiohead’s Amnesiac and Massive Attack’s Mezzanine, and with each and every one of them the lows coming from the Klipsch system always sounded tactile, impactful and composed, never overpowering the rest of the music. But it was in the midrange where the Klipsch system really proved its mettle. Some speaker systems can make mincemeat out of Jay-Z’s guest vocals on “Suit and Tie” from that same Timberlake album, muddying up his delivery and execution. With the HD 600, the effect was just the opposite: Both Jay-Z’s and Timberlake’s vocals sounded, cleaner, clearer, and better-enunciated than we’re used to hearing from speakers of this size and price. The mini Klipsch system made it easy to understand all of the lyrics, whether sung or spoken, on this deeply-layered album. About the only nits we had to pick with the Klipsch system were with the sonic regions either side of the midrange. Helene Grimaud’s excellent recording of Beethoven’s Fantasia for Piano, Chorus, and Orchestra, for example, had less power and impact through the lower mids and upper bass than it should have, leading to a slightly thin sound. Upper end harmonics and decay information from Grimaud’s piano also seemed a bit harder and glassier than we’re used to hearing. Lastly, the HD 600’s lower treble seemed a touch too bright at times. Listening to some other Radiohead albums, such as OK Computer and Kid A, cymbals, xylophone and other percussion instruments were all somewhat artificially emphasized, causing music to sound livelier and more forward in tonal character than it should’ve been. Still, this was fine performance from such a low priced system, and the sound remained much bigger, richer, and fuller than the system’s miniscule size would suggest. 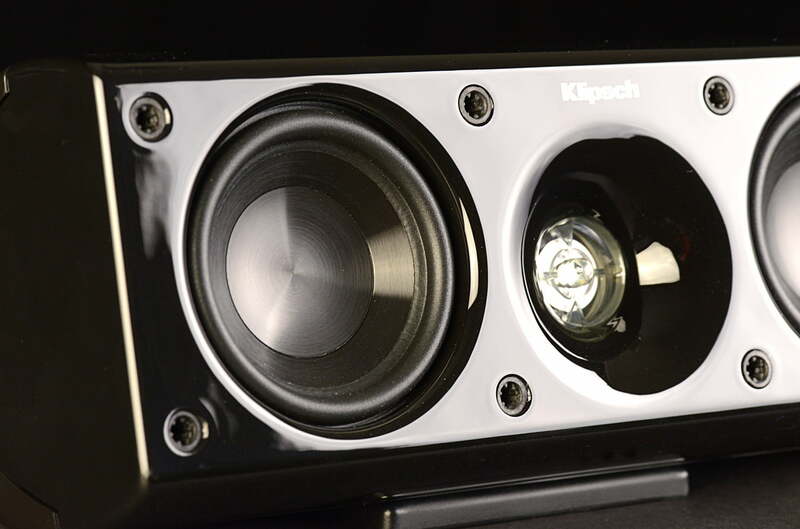 When we first set up the Klipsch system in our usual speaker positions, we thought we were gonna have to brace ourselves for a negative review. Luckily, that assumption proved unfounded. 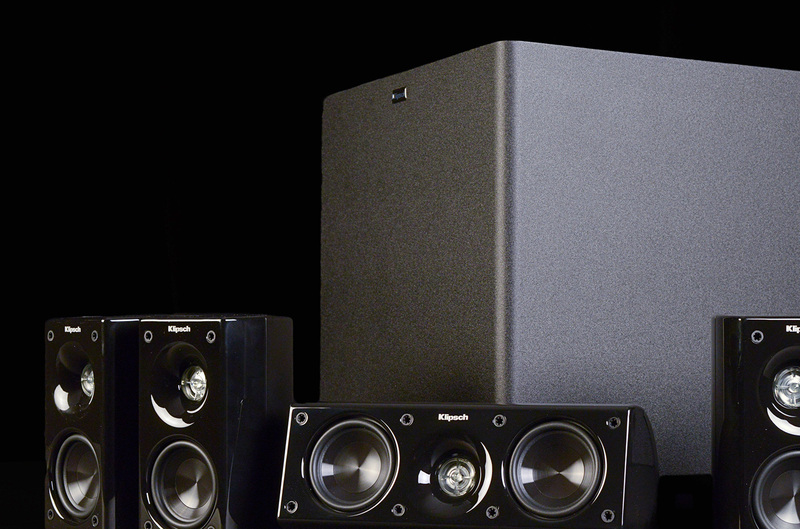 Once the system found its happy spots in our room, the Klipsch HD Theater 600 consistently proved itself to be well-balanced and highly listenable. Time and time again, it simply went about its business the best way it could, delivering a clear, open, and surprisingly powerful sound. Sure, the Klipsch system isn’t completely without fault; we could’ve done without that treble brightness and lean lower midrange which may not be too kind to older rock recordings. And the HD 600 is, without a doubt, the most placement sensitive satellite speakers we’ve ever come across. Once it’s dialed-in though, we couldn’t imagine anyone not enjoying the type of balanced and exciting sound the HD 600 system offers. If you’re looking for a super compact set of speakers without breaking the bank, be sure to put the Klipsch HD Theater 600 system on your shortlist.